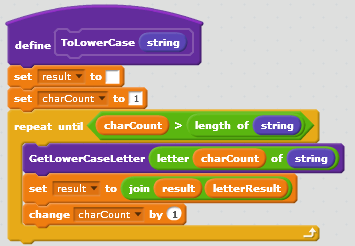 With the release of Scratch 2 came the ability to create your own blocks, which in programming terms is the ability to create your own procedures or methods. One thing you can’t do with custom blocks is to return values from any computation performed in your block. You need to assign the result of any computation to a variable. In this post we are going to look at recursion. The first question you may ask is “what is recursion?” — Simply put, recursion is the ability for a function/method (I tend to use the term method, but in the context of this post, they mean the same thing) to call itself. 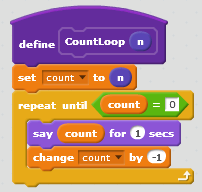 Now, with the advent of custom blocks in Scratch, recursion becomes possible. 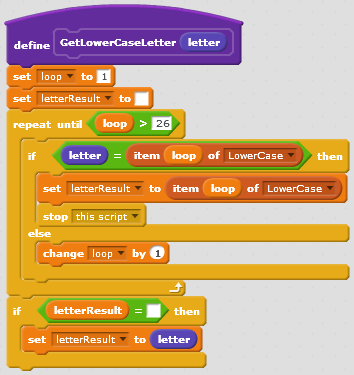 Before custom blocks, a form of recursion was possible in Scratch using broadcast blocks. There is a complete article on the Scratch Wiki about recursion, and I would recommend you read it. it can be found at http://wiki.scratch.mit.edu/wiki/Recursion. So, first, lets have a simple recursion example. Consider you want to be able to count backwards from a specific number down to 1, easy, just use a loop, and to be honest that would be the best way to do this, but this simple example does give a good, simple introduction to recursion. First, lets have a look at how we would do this in a loop, defining a custom block. We can then call this by simply using the CountLoop block and providing a parameter, say 10, and this will count down from 10 to 0, nothing particularly difficult here. Now consider the version below. 2. The IF block checks if the value passed in is greater than 0. If it is, we display the value of n.
3. After displaying the value, we call the block again, using the value of the parameter that was originally passed in (10) minus 1. So the block is called with the value 9, and the whole process starts again. This will continue to happen until the value passed in is 0 and then it will end. The IF block in our recursive block is very important. In programming terms, this is called the base case. The base case determines when the recursion will end. If there was no base case, the block would call itself forever, the same as an infinite loop (think forever block!). The opposite to the base case, is the recursive case. The recursive case is what happens when the base case has not been satisfied, in our example, its what happens within the IF block. Whilst the example above was perfectly valid to introduce the concept of recursion, you would usually use the loop construct to achieve the desired result. Lets look at something more valid. Very often, recursion examples use calculating the Fibonacci Sequence as an example. 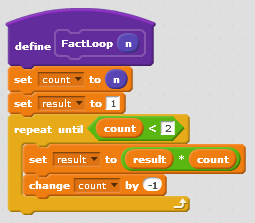 I’m not going to use this, I am going to use the calculating the factorial of a number, this lends itself well to explaining issues with recursion and also lends itself well to explaining an issue with recursion in Scratch 2. A fairly simple piece of code to calculate the factorial of a number. 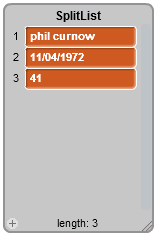 You will see if you call this block with the parameter 5, the variable result will contain 120, which is what we want. So, how do we do this recursively? Before I explain how to do this in Scratch 2, I want to move on to a little bit of programming theory, stick with me here, hopefully this won’t be too bad!! We can then use the method as follows int result = factorial(5); and you should get the answer 120. As you can see, there is a lot going on here to calculate. The reason this is happening is because of this line of code in the method: return n * factorial(n – 1); The factorial method is being recursively called, but we also need to multiply the result of the recursive call by the previous value of n. You can see how this could cause stack problems should you wish to calculate the factorial of a large number. So, whats the recursive alternative? 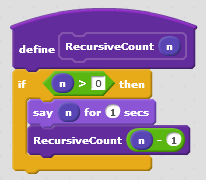 Well, there is an alternative, its called tail recursion and this is the type of recursion that you would ideally need to implement in Scratch 2 to recursively calculate the factorial of a number, as we have no version of the return statement in Scratch. Tail recursion may sound complicated, but to be honest, its an awful lot easier to understand whats going on than the example above. And because our base case says if the value of n passed in is less than 2, we return the value of accumulator, which will be 120, which is the factorial of 5. I’m sure you will agree, this looks an awful lot easier to understand than the first version!! How do we do this in Scratch? Some of you may be saying, well this still implements a return, how can we do this in Scratch. 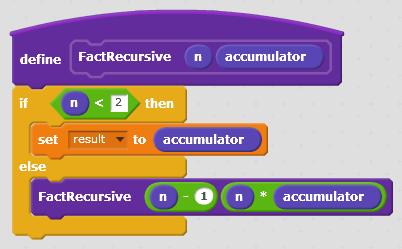 Well, with the single return, to do this in Scratch we would just assign the value of accumulator to a variable, as this is done in the base case, so there is nothing else needed to be done in the recursive method. So here goes, here is the recursive block that implements the tail recursive version of our method. As you can see, the only difference between our Scratch version and the C# version is that when the base case condition is met, we assign the result to a variable and not return it. If you have got this far reading, thanks for sticking with it!! Recursion is interesting and one worth learning. As you can see, there are always ways of getting around issues with Scratch, and this also demonstrates the power of some of the new features of Scratch 2. 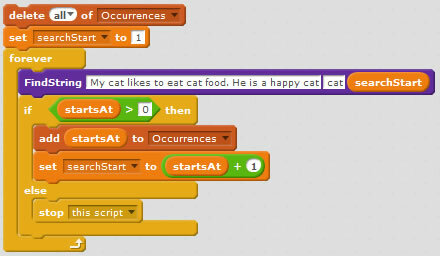 Variables in Scratch allow us to store a single piece of data that we can use in our scripts. This blog post will introduce Lists (also known as arrays in other programming languages). Where variables allow us to store a single piece of information, lists allow us to store multiple pieces of information in the same way we would make a list of items on a sheet of paper. One of the most common lists we make in our lives is a shopping list, and I will use the idea of a shopping list to explain the concept of Scratch lists. When we write a list on paper, we very often add items to the list from top to bottom, i.e. we add item 1, then item 2, etc. We can do this with lists in Scratch, and we can also insert items at a specific location in the list, remove items from a list, etc. In this post we will cover all the actions you can perform on a list. Code blocks will also be given to show exactly how you express this in the Scratch environment. 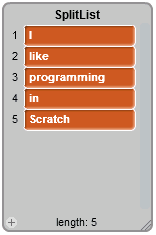 To create a list in Scratch, from the Block palette select Data and then click the Make a List button, give your list a name and then click OK, an empty list is then displayed on the Stage. At this point you are then ready to start adding items to your list. In all the example code blocks in this post, the list will be called ShoppingList. Where we see the word thing, we replace this with the word, number or sentence we want to add to the list. Looking at the picture of the list at the beginning of this post, we can see the first item in the list is Apples, so we replace thing with Apples, and we then have our first item in the list. If we then add another item, say Oranges, you will see that this is added to the bottom of the list. As we keep adding, the list grows. In programming terms, a list is dynamic in size, meaning it is not a fixed length. 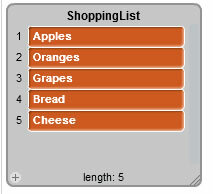 As we are building a shopping list, we want to be able to add many items to it. The code block below allows this to happen. All the code is doing is repeating a block of code asking the user what they want to add to the list. If the user enters the word finish the code block stops. So, as we can see its very easy to add items to the end of a list. What about if we want to insert an item within our list? Well this is very easy to do by using the insert block. The insert block allows us to specify what we want to insert and the position in the list where we would like to insert it. If you click on the drop down on the insert block, you will see by default the options 1, last and random. Selecting 1 will insert the item at position 1 in the list, moving the current items in the list down by 1 position (so the current item 1 becomes item 2, etc), last will insert at the end of the list (the same as adding) and random will insert into a random position in the list. We are able to specify the exact position in the list we would like to insert our item. The code block below shows an example of inserting into a list. As you can see, everything that was in position 3 onwards in the list has now moved down one position. Deleting, or removing items from a list is achieved by using the delete block. You specify the item number you want to delete from the list. By default, the drop down in the block contains 1, last and all, but you can replace this with your required item number. the option all will delete every item from your list (essentially emptying the list), and this is something I would recommend that you do before at the beginning of your scripts. Generally you will always want your scripts to work with an empty list. The code block below shows how to delete an item from a list. What else can we do with a List? Again, as with all the other list functions, there are blocks that allow us to do the three things. Lets have a look at these in order. Finally, we can search a list for an item. As you can imagine this is a very useful thing to be able to do. You can do this by using the contains block. The code block below, shows an very simple example of searching for an item in your list. 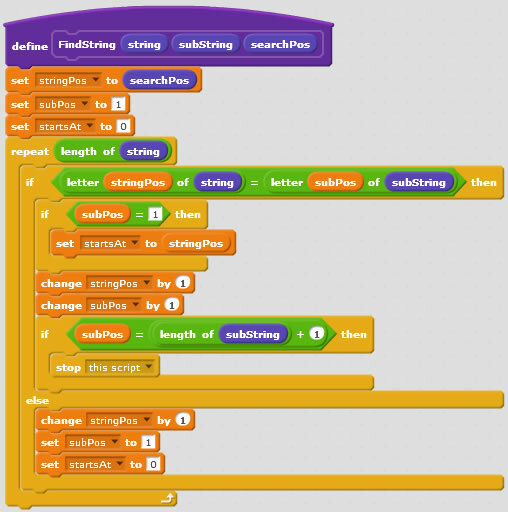 This has been a brief introduction to using lists in Scratch. I do hope you find it useful. Feel free to comment on this, use it in your teaching or any way you see fit.